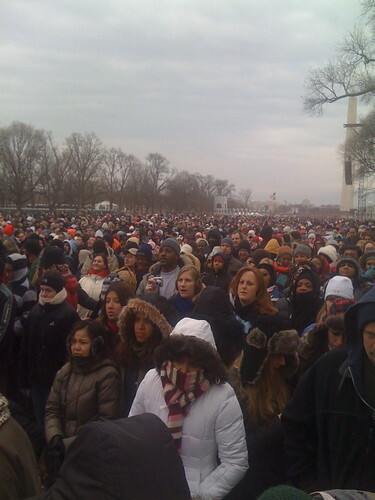 Yesterday some friends and I headed down to the Lincoln Memorial for the “We are One” concert in celebration of Barack Obama’s Inauguration. It was incredible. We got down to the memorial on the metro relatively easily and walked into the Mall around noon. It was pretty cold standing for the two and a half hours before the show began, but it was incredible to watch the crowd swell until it filled the space between the Lincoln and Washington memorials. Hearing John Legend perform “Shower the People You Love with Love” with James Taylor, U2 perform “One” and “In the City of Blinding Lights,” Bruce Springstein and Pete Seeger play “This Land is Your Land,” and Sheryl Crow play with Stevie Wonder and Usher was pretty amazing. I was surprised how much I enjoyed Garth Brooks. Messianic expectation is tricky. So much of the tone of the election and the build up to the end of the Bush Administration sets President Obama with a huge degree of salvific expectation. The amount of pressure for change and transformation is palpable. They say that after Obama’s first national speech at the 2oo4 DNC, in Kenya people were running around telling one another “now we will have paved roads! A Kenyan has a role in the US Government!” Unrealistic expectations are rife for our president elect. Jesus of Nazareth faced unrealistic expectations. First Century Palestine was a land awaiting liberation. The machine of Pax Romana had installed a violent governor in Jerusalem and the Hebrew people lived under the Empires thumb. Groups waited for the Meshiac, the Messiah, the promised king of the line of David who would come and lead a military revolt to remove the foreign oppressor and inaugurate an eternal reign in Jerusalem. The Archangel Michael, Elijah, the and the shadowy priest Melchizedek were all mythic candidates for the role of savior. Into this expectation stepped a young poor carpenter from the backwater of Nazareth. He chose not to lead a military revolt, but instead modeled a life of service, love, and resignation. His crowning occured upon the cross, the most scandalous execution possible for a Jew. He was not an almighty king, but a silenced convict. Yet, this is who we proclaim as messiah: a teacher who pointed to a different possibility…not a military rule, but a reign of justice, peace and love. The only response for Jesus to messianism was to transform the expectations of those around him. In transforming their desire to see a king into a desire to inaugurate the Kingdom of God. His life and ministry were about the transformation of hope. I hope that our new president is able to meet unrealistic expectation with integrity. Though some may misunderstand and be disappointed when their unrealistic hopes go unrealized, others may be transformed. The only response to messianism is the transformation of desire. May God work with our new president to give us a new way to dream in America.